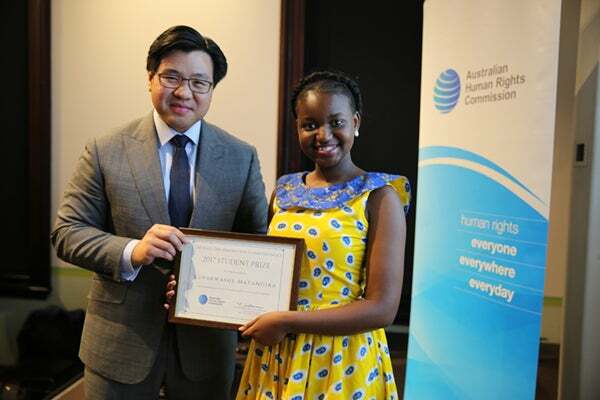 The Race Discrimination Commissioner's Student Prize is an annual competition for school students aimed to promote research and discussion of racism among young people. Entries close 11 May 2018. Students in Years 10 and 11 at a school in any Australian state or territory are eligible to enter. Entrants may write an essay (maximum 1,000 words) or record a speech (video or audio, maximum 5 minutes) and submit it to the Commission via the entry form by 11 May 2018. “The responsibility of fighting racism is ultimately borne on the shoulders of its victims.” Do you agree? How does the history of race in Australia shape current debates about identity and human rights? A promotional poster for the Student Prize is available for download here. Schools can print these off and display them to spread the word about the Prize. The winning student will be awarded a book voucher from Dymocks worth $150.00. Their work will also be featured on the Commission's website and in the Commissioner's monthly newsletter. The winning student's school will be awarded a book voucher from Dymocks worth $500.00. The best entry will be selected by the Race Discrimination Commissioner and the winner will be awarded their prize at the Annual Kep Enderby Memorial Lecture in Sydney in June 2018. The winner of the 2017 Student Prize was Kupa Matangira, a Year 10 student at Hunter Christian School. Kupa took out the Prize with her essay ‘The Ugly Truth Behind Racism’. You can read more here.